Dean Martin didn’t wear a tuxedo to look “cool”, that was merely the after-effect. Dean wore his tux as though it was just something he had to do, so – as long as he was doing it – he may as well be comfortable. The film’s tuxedo didn’t deviate far from Martin’s usual stage or TV show look: a black dinner suit with a comfortable shirt and a pocket square. Like the rest of his wardrobe both in Ocean’s Eleven and in real life, it was created for him by the Rat Pack’s preferred tailor, Sy Devore. 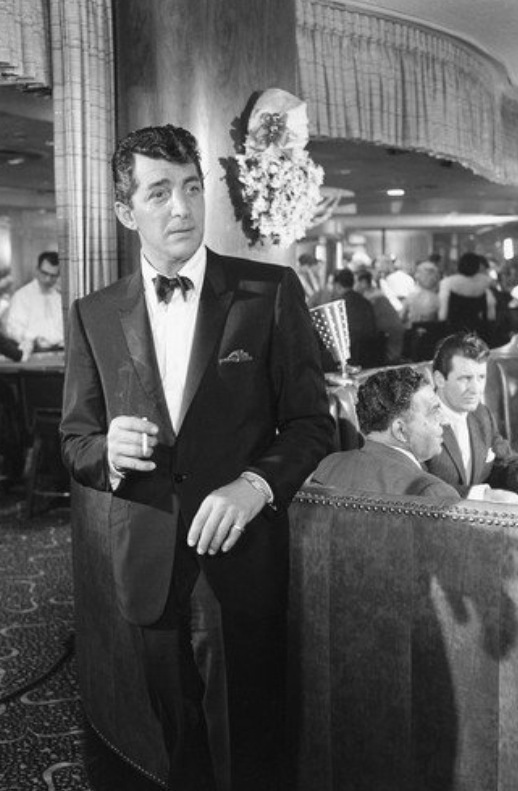 The sheen of Martin’s dinner suit implies mohair, both a popular men’s suiting during the 1960s and a wise choice for a warmer climate like Las Vegas. The ventless dinner jacket is single-breasted, closing with one satin-covered button in the front. The peak lapels are faced in black satin, and there is a half-inch of black satin striping on the edge of each cuff. The shoulders are padded and there is roping on each sleevehead. Martin wears a red paisley silk display handkerchief in the welted breast pocket, and the hip pockets have black satin jetting. The shirt is what differentiates this black tie outfit from the traditional. In the film, and several documented photos and footage from his other shows, Martin wears much more casual white shirts with button-down collars. Typically, this is not done. It is considered a sloppy look. While I wouldn’t recommend it, I will also go on the record and say that it works for Dean Martin. Why? Dean Martin was an ex-boxer from the small town of Steubenville, Ohio. He was ridiculed by his peers and worked odd jobs ranging from working in a steel mill to dealing blackjack in an illegal casino to delivering bootleg whiskey. Of the main members of the Rat Pack, he was the most humble; he didn’t dress to show off, he dressed to be comfortable while entertaining. Seriously, does anyone think he isn’t cool? The casual white button-down isn’t a recommended look for black tie, but, looking at the images of Dean in his tux, can you say that he doesn’t look cool? If anything, the shirt is just one more part of Dean’s personal expression, throwing convention to the wind and doing what makes him comfortable. Why not, in his case? Dean completes his look with a large butterfly-shaped black satin bowtie. On his feet are black leather oxfords – another less formal digression from traditional black tie – over thin black dress socks. Dean wears his accessories, a silver pinky ring and a silver chain bracelet, on his left hand. Dean knows the right way to do Vegas. Dean Martin certainly loved women. Luckily for him, he attracted them in hordes. Luckily for his wife, he was the most loyal member of the central Rat Packers: Sinatra, Martin, and Sammy Davis, Jr. Unfortunately, this isn’t saying much as Martin still engaged in several affairs, but not nearly to the extent or the debauchery of Frank or especially Sammy. Dean Martin is presented with his options for the evening. The best way to emulate Martin for New Year’s would be to put on a sharp but comfortable tux, have a lovely young lady on your arm and treat her respectably, light up a Lucky, knock back a few highballs or martinis before switching to champagne, and assist in the robbery of five Vegas casinos at midnight. 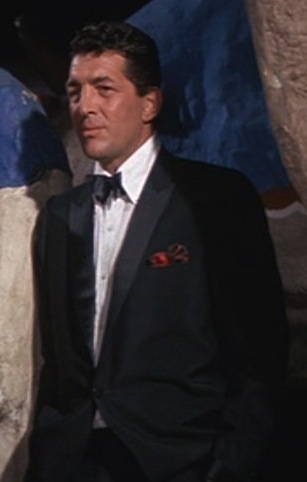 Dean Martin adopted his own atypical black tie look. If you feel you can pull off your own individual style, go for it! Maybe wear a comfortable shirt or a fun pocket square, just don’t wear white socks and/or tennis shoes. No matter who you are, that looks stupid. Shirley MacLaine: Hey, gimme a little kiss, how about it, huh? Sam Harmon: Sound idea; it’s constructive.